Becky Hammon <a href="http://espn.go.com/wnba/story/_/id/11398376/playing-career-ends-san-antonio-becky-hammon-hardly-finished">retired from playing</a> in August after a 16-season career that included four trips to the WNBA Finals. But as she steps into her role as an assistant coach for the San Antonio Spurs -- the first full-time female coach in the NBA -- espnW's Mechelle Voepel takes a look back at the long career of the seven-time WNBA All-Star, two-time All-WNBA First Team honoree and three-time NCAA All-American. Becky Hammon retired from playing in August after a 16-season career that included four trips to the WNBA Finals. But as she steps into her role as an assistant coach for the San Antonio Spurs -- the first full-time female coach in the NBA -- espnW's Mechelle Voepel takes a look back at the long career of the seven-time WNBA All-Star, two-time All-WNBA First Team honoree and three-time NCAA All-American. At Colorado State from 1995-99, Becky Hammon led the Rams to three NCAA tournament appearances while compiling 2,740 points and 538 assists. Colorado State reached the Sweet 16 her senior season. Becky Hammon wasn't picked in the 1999 WNBA draft, but caught on with New York as a free agent. In eight years with the Liberty, she averaged 10.4 points and 2.5 assists. Traded to San Antonio in 2007, Becky Hammon was actually entering her best individual seasons in the WNBA. She averaged 15.6 points and 5.1 assists in seven seasons with the Stars. Hammon was named one of the WNBA's Top 15 Players of All-Time in 2011. Becky Hammon took some criticism for playing with the Russian national team in the 2008 Olympics, but said she didn't think she had a real chance to make the U.S. squad. 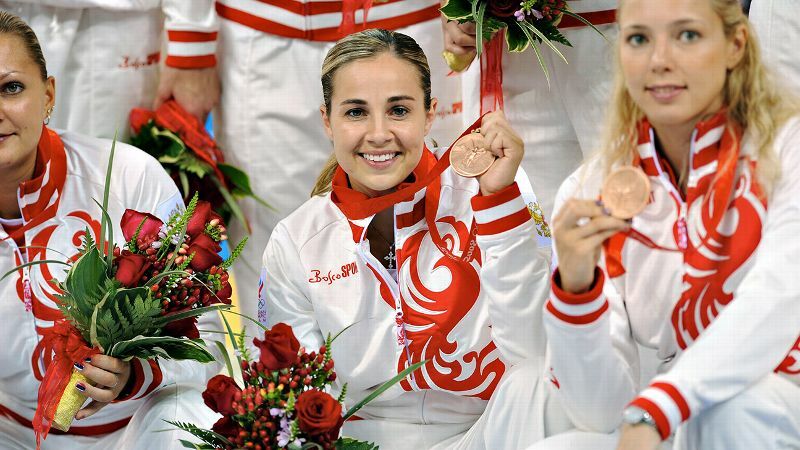 She won a bronze medal in the Beijing Games and also prized the friendships she forged with her Russian teammates. Becky Hammon got to know NBA players such as Tim Duncan and David Robinson while competing with them in All-Star Game exhibitions and with the Stars' connection to the Spurs organization. That provided some groundwork for her being hired as an assistant coach for the Spurs.